Chestertown, MD, May 2013: Curtis Dorsey, lifetime Kent County resident and owner operator of Dorsey Bus Services will be honored posthumously as the Grand Marshall of the 2013 Chestertown Tea Party Festival Parade. Mrs. Anna Mae Dorsey and Mrs. Ruth Briscoe will represent Mr. Dorsey in the parade. 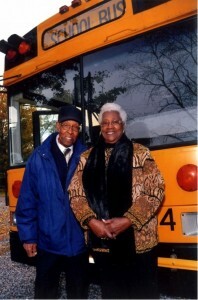 Mr. Dorsey and his wife, Anna Mae, operated Dorsey Bus Services for over 60 years before retiring in 2012. They purchased their first bus in 1958, after he had worked as a mechanic and occasional driver at a local car dealership. During that time, they touched the lives of generations of Kent County school children, whether getting them back and forth to school, transporting sports teams, or taking classes on field trips. He also carried many an adult group on their field trips. The Dorseys provided jobs to scores of local residents and trained future school bus owners. Mr. James Schauber, who will be providing shuttle bus services for the Tea Party Festival this year, told us that he was trained by Mr. Dorsey. In fact, the Dorseys operated the shuttle bus services for the Tea Party Festival for many years, until their retirement. Mr. Dorsey would tell the Board of Directors, not to worry, he would get people where they needed to be, and he did. The Dorseys were honored at a retirement banquet in November 2012 at the Betterton Fire Hall. Mr. Dorsey passed away in January 2013, at the age of 88. He was a World War II veteran, a lifetime member of the Parker White Post 143, and a member of the NCCOL United Methodist Church in Fountain. Mr. Dorsey is survived by his wife, Anna Mae, son Larry Clark, three grandchildren, five great-grandchildren and a host of other adopted sons and daughters. Mr. Dorsey will be sorely missed and fondly remembered by those whose lives he touched.